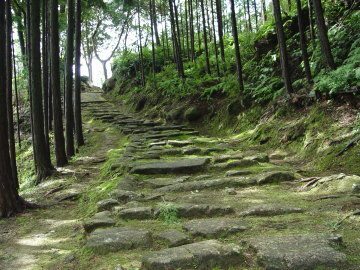 A beautiful stone path on Hadasu-no-michi Path is said that it was constructed in Kamakura era (1185-1333). This is the oldest among remains in "Ise-ji Route." 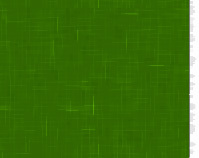 It is very short but its atmosphere is unique. 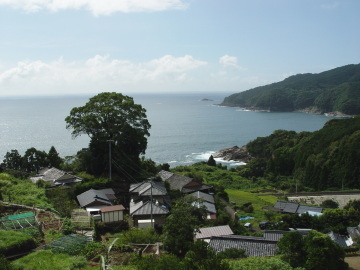 Hadasu-cho has the legend of "Jofuku," who was washed ashore here from "Shin (ancient China)" for an elixir of life. The big tree of the left picture is "Jofuku-no-miya Shrine." 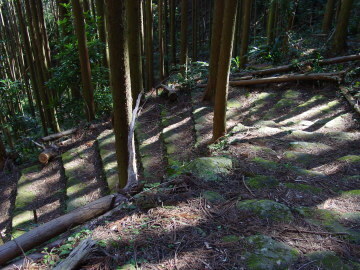 Obuki-toge Pass is famous for its beautiful bamboo forest (next picture), but there is good stone path on this trail. Around Obuki-toge Pass, there is beautiful bamboo forest. 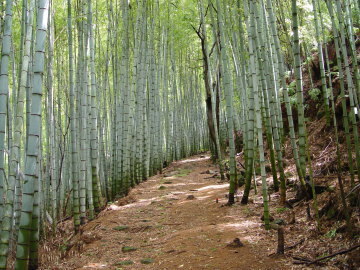 There is few path which through bamboo forest in "Ise-ji Route," and this is the most beautiful.